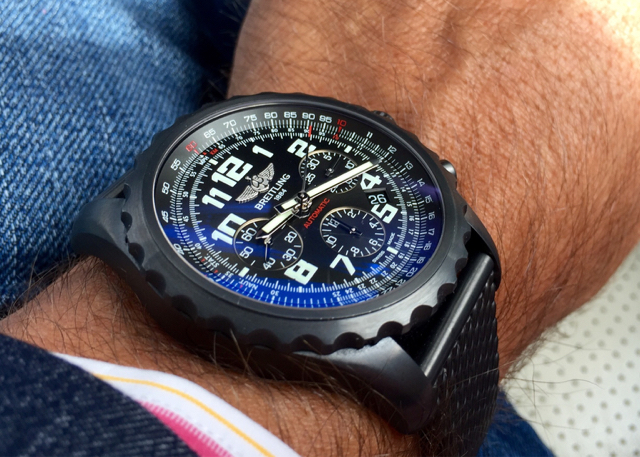 This is the watch that made me fall in Love with Breitling. My Grail Watch. I've been after this watch for a number of years. Finally a opportunity presented itself and I jumped at it. I'll try and do a little review. I have a number of other watches and some of them are not that easy to read. Take for example my Navi 01. Don't get me wrong. Its an absolutely beautiful watch. The only issue is really my eyesight. I'm 45 years old and the eyesight is not that great anymore. The Navi has thin Hour and Minute hands. To make out the time I have to look carefully. On this Chronospace the Minute and Hour hands are nice and thick. They also contrast very well against ALL BLACK dial. The dial has lots of detail (that I like) but it doesnt interfere with telling the time. I also like the fact that it has Hour indicators showing the actual hour. I can see the time instantly. My Navi 01 has the inhouse movement that is beautiful but it's also super quiet and still. The movement in the Chronospace is a bit of a Wobbler. I can feel the Rotor move on my wrist. I can hear the rotor wind the mainspring in a quiet room. I love this about the Chronospace and miss this in my Navi. The Chronospace is ALIVE on my wrist. So far timekeeping is about 3sec per day fast. That is good ! I know there are always concerns about the Black Steel marking. I've only had the watch for a month or two and so far, no marks. I don't wear the watch every day (saving it:)) so I think the wear and tear will probably be reduced. The actual Black Steel is not totally Black. It more like a Gun Metal Black and looks very rugged. I absolutely love everything about this watch. It is my true Grail watch. I am very happy and fortunate to own it. Thanks for the writeup and pictures. 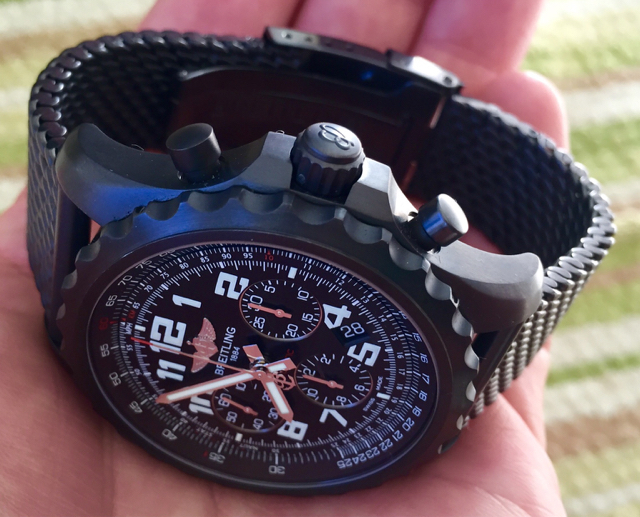 The hands do pop off the dial which I really like on my Blacksteel Blackbird. I love the double AR crystals too. Very nice looking piece. 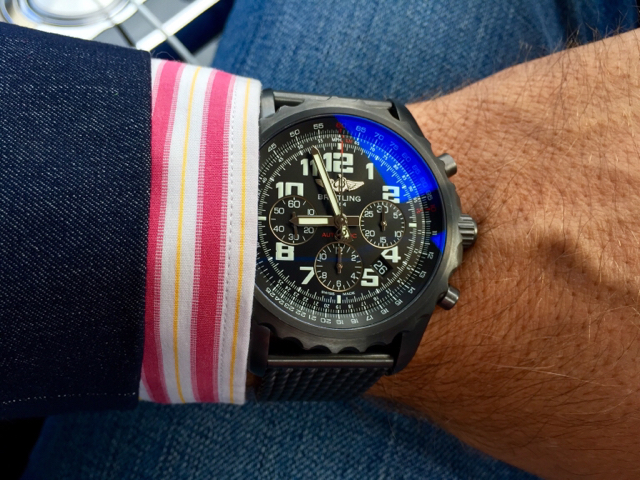 Blacksteel Breitling are my favorite, but I've never owned a Chronospace. 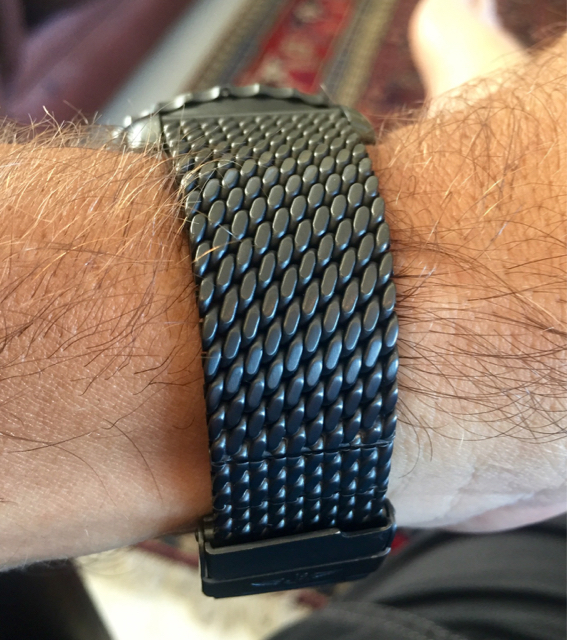 I love the black mesh, very nice combo, and thanks for the review! Great review. The watch is stunning. Glad to see the Chronospace getting some air time. To me it is the less talked about model in the Professional range. Keep us posted with your ownership experience on this thread. I've been enjoying one of these for a couple of years now, and appearance wise it is about the same as the day I took it home. It's quite a resilient watch. Enjoy it! Just sold my Navitimer fighter edition ivory face because of failing eye site. My new one is a Navi 1461 blue face and can see the time again, instead of it just looking great on my wrist. After seeing your watch I am now working on the wife that I really do need another watch . I just love that look. There are to many good looking out there, just wish I had deeper pockets. "It is just a matter of time!" Black steel looks absolutely stunning, got my eyes on it for a while now.